We want to host your next event @ Beta Lounge! Whether you are just organizing a last minute group gathering (impromptu), or want to reserve a section of Beta Lounge for your group (semi-private) or want to reserve all of Beta Lounge for a completely private event, we can surely accommodate. 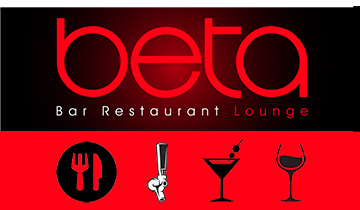 We can host your day or evening events at Beta Lounge! Anytime from 10am-2am (7days a week) with prior arrangement. Bring your departmental mixers to Beta Lounge! You have worked so hard! Let us help you celebrate your graduation. We can provide you with discounted group drink packages and appetizers. From 6 to 75 people. Let us host your birthday party with Champagne! We also work with local bakeries and can order and serve your special birthday cake. Bring your corporate events to Beta Lounge! We can accommodate up-to 75 persons. Drink, mingle and do your business! Reserve Beta for your next Christmas Party and/or New Years Party now!